I have to confess that getting the leadership of Jewish Voice for Labour to see sense and remove some of its Zionist members was like drawing teeth. A few days ago I was contacted by members of Jewish Voice for Labour, which sees itself as an alternative Jewish group in the Labour Party to the Jewish Labour Movement. 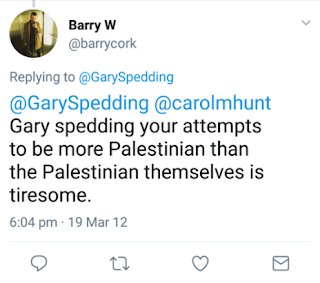 Why they wondered had the Steering Committee decided to accept Gary Spedding in its Facebook group and as an associate member? A Zionist who believes that people who are Black cannot be Jewish, because that is what the political on Jackie is about, surely has no place in a group like JVL. No one ever challenges the credentials of white people who say they are Jewish by virtue of their father, which is Jackie’s situation. This has long been accepted in Reform Judaism. Spedding also criticised Ken Livingstone as ‘anti-Semitic’. He has also accused me of ‘anti-Semitism’. 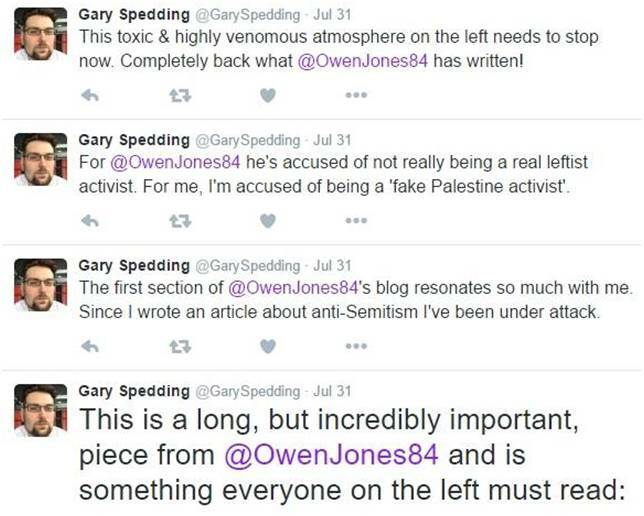 Lacking all self-awareness, since Spedding suffers from an extreme form of narcissism, he didn’t understand why it is not a good idea for someone who isn’t even Jewish to call Jewish people anti-Semitic. In his Ha’aretz article he wrote that 'Anti-Zionist Jews are also not immune from being complicit in, and promoting, anti-Semitism.' Less considerate people than me might say that that is a good example of anti-Semitism. Spedding is one of the few people to have given credence to the lies of Angela Eagle that she was subject to homophobic attacks at a meeting she didn’t attend in Wallasey CLP. These lies were used to suspend Wallasey CLP. Most people discounted them, but not Spedding. So although being a socialist or a Corbyn supporter isn’t an absolute condition of membership of a non-Zionist Jewish alternative to the JLM being a witch-hunter should certainly debar you. It is a curious phrase ‘armed violence’ to describe the one-sided attack by Israel on the defenceless Palestinians of the Gaza. 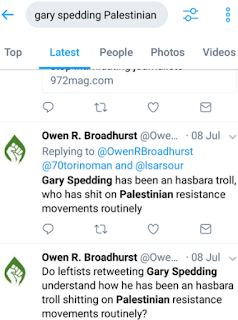 It suggests that Spedding was deliberately seeking to minimise the one-sided nature of that conflict by equating Palestinian defence with Israel’s armed aggression on a people under occupation. 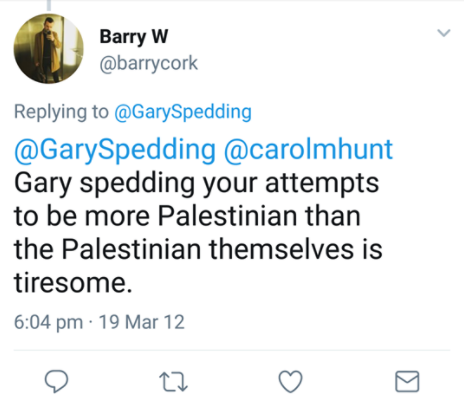 In stating that anti-Semitism ‘has no place in campaigns of solidarity with the Palestinians’ Spedding implied that anti-Semitism had such a place. i. Drafting an EDM which SNP MPs and John Mann signed linking opposition to Israel’s Operation Protective Edge, when 2,200 Palestinians were murdered, with anti-Semitism. This lie provided the pretext for the formation of the Campaign Against Anti-Semitism, a far-Right Zionist group which even other Zionist groups keep their distance from. ii. 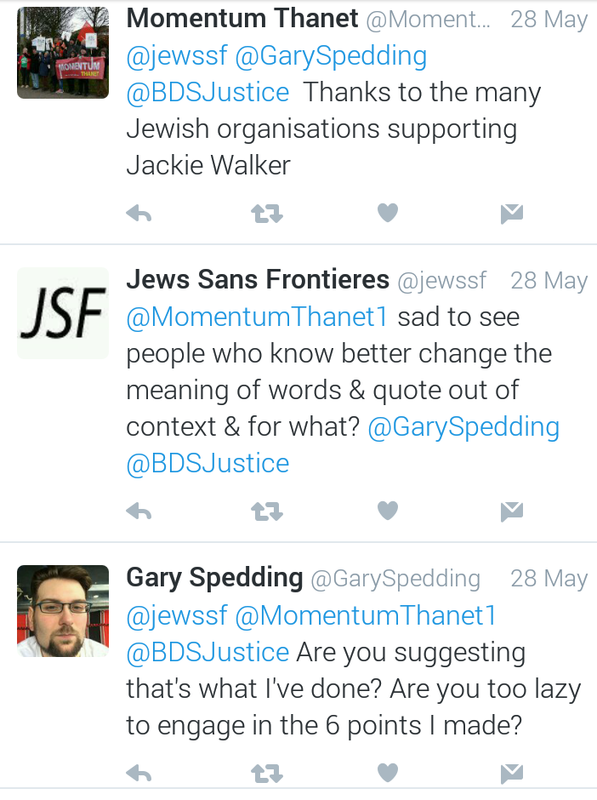 Spedding attacked as anti-Semitic both Ken Livingstone and Jackie Walker. iii. Spedding attacked Ali Abunimah of Electronic Intifada. iv. Spedding was a member of the liberal Unionist Alliance party in the North of Ireland. v. Spedding has given full support to Owen Jones’s campaign, alongside the Jewish Labour Movement, in its attacks on Jackie Walker and Ken Livingstone. vi. 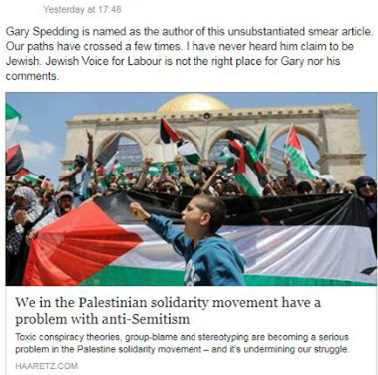 Spedding has praised the Community Security Trust, a Zionist vigilante group that specialises in conflating anti-Semitism and anti-Zionism. Its Deputy Director Dave Rich recently brought out a book, The Left’ Jewish Problem. 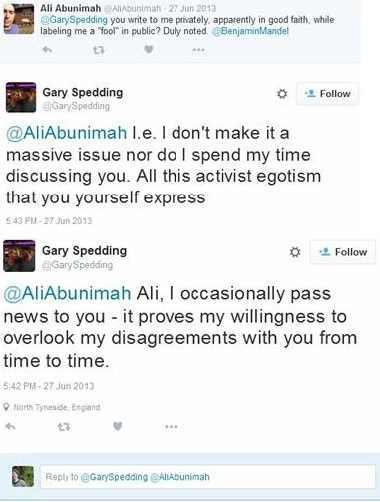 Gary Spedding Calls in the Police - I have been harassing him! What is particularly outrageous is that I and others were excluded from JVL because of political disagreements with the Steering Committee whereas open Zionists seemed able to waltz in with the blessing of the FB moderators– Messrs. Kuper, Cushman and Saville. I was particularly critical of the fact that it had avoided open support for the Palestinians in its Statement of Principles in favour of an anodyne ‘We stand for rights and justice for Jews everywhere and against wrongs and injustice to Palestinians.’. The Right of Return, a basic democratic demand or even opposition to the bogus anti-Semitism witch-hunt were not mentioned. Whereas the JLM is an explicitly Zionist group, the JLV prefers not to even mention the word. I therefore penned an open letter to JVL about what was happening and sent it by Messenger to all 160 or so of their Facebook group. This led to my exclusion from their Facebook group. Such is the price of free speech (although all the moderators are members of Free Speech on Israel!). The JSG, a group which barely exists today (its last magazine came out over a year ago) have taken my criticisms particularly badly. This is because I called on them to distance themselves from Jon Lansman, the Momentum proprietor and dictator, who is also a member of the JSG. Lansman bears most responsibility for the suspension of Jackie Walker. When the JLM attacked Jackie after last year’s Labour Party conference, Lansman immediately leapt to their defence. He told the Independent that their Chair Jeremy ‘perjurer’ Newmark was ‘very upset and I can understand that – I work closely with Jeremy, I’ve been meeting with Jewish organisations to talk… I’ve been outspoken. I was very, very unhappy about… and I did comment on it, about it, what she had previously said.’ Lansman joined in with the political lynching of a Black comrade who was his own Vice-Chair without once asking for her opinion. Newmark is a paid propagandist and Israeli state agent. The idea that he was ‘upset’ is fanciful. He was probably delighted to have a pretext for attacking Jackie. 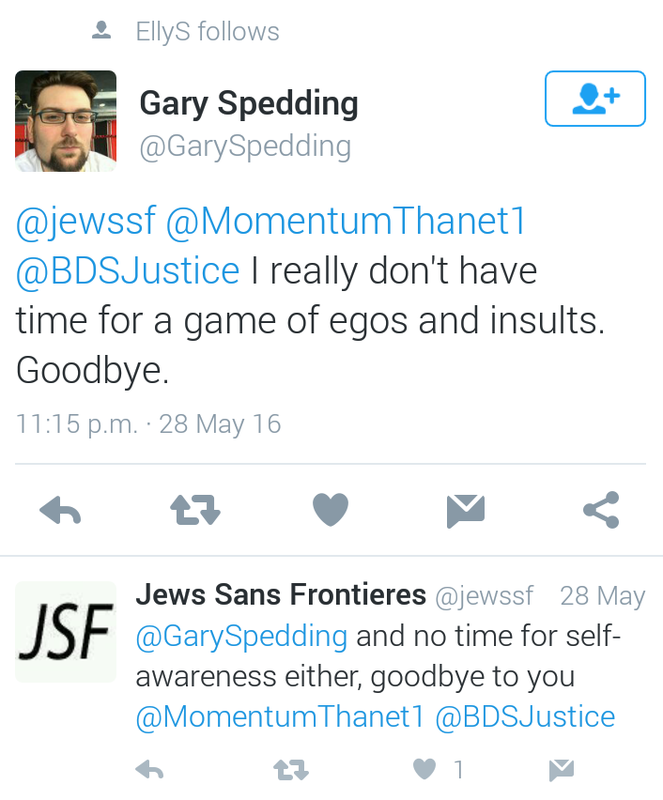 Lansman scabbed on her and the JSG refused to call him out on this. In a number of posts I called on the JSG to distance themselves from Lansman, e.g. I initiated a campaign in October 2016 to get the JSG to come off the fence. Some 5 months later the JSG finally caved in to the pressure. But they did so with little grace. 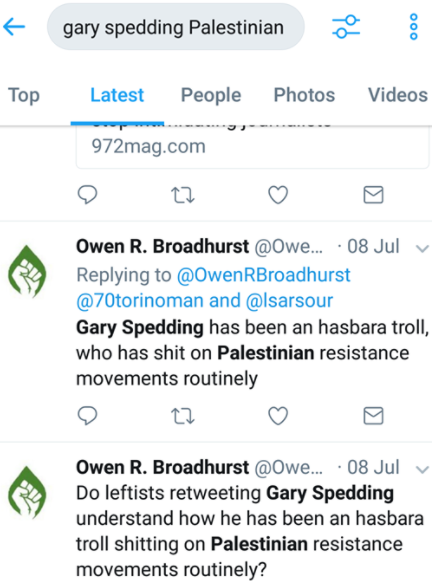 David Rosenberg, who previously I have known as affable and mild mannered, the leading light of a progressive if somewhat ineffective Jewish group, had taken any criticism of Corbyn for his backtracking on Palestine to heart. 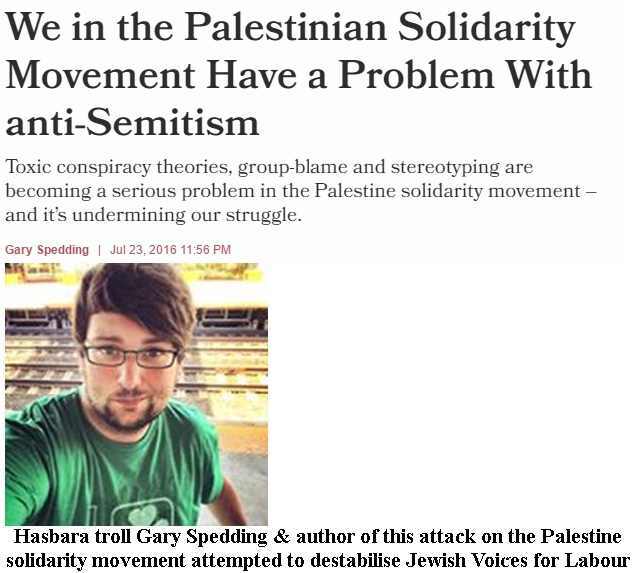 'Our group is anti-Zionist but does not go in for gratuitous and childish demonisation of those who identify as Zionists’. Jews 4 Jeremy was set up by a number of people, Debbie Fink and me included, not just JSG yet Rosenberg referred to it as ‘our group’. They had deliberately let it run down, opposing it doing anything collectively about the witchhunt. Like Debbie I was also removed from JSG's Facebook Page for Asking Awkward Questions about Lansman. As I wrote in my second letter to JVL, this kind of response was knockabout stuff designed to avoid debating the real issues. A large number of people on the JVL Facebook page agreed with my comments with one resigning. With difficulty I persuaded two others not to resign. Nothing here about lies or smears but plenty about ‘attacking’ (i.e. 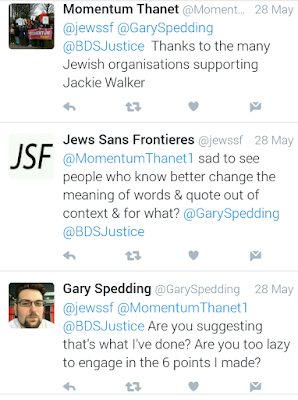 criticising) the steering group and even worse circulating those criticisms to JVL members. The correspondence in question was anything but private. It was part of a political polemic between Rachel Lever and others regarding the formation of the JVL. The real reason why Rosenberg and Saville indulged in these transparently poinless lies is political. Rosenberg and what’s left of the JSG believe that we should be completely uncritical of Jeremy Corbyn, his retreat from Palestine and appeasement of the JLM. I take the view that if we don’t exert counter-pressure on Labour’s leadership then the JLM will triumph by default. From the day that I was first asked to sign up to the JVL’s principles I have argued that the group should not be Jewish only. JVL’s Steering Committee has decided that whereas Jews can be full members, non-Jews can only be Associate Members. The Steering Committee, whose composition hasn’t been made public, but which is believed to include Jenny Manson as Chair, Mike Cushman as Treasurer/Secretary, Naomi Wimborne-Iddrissi, Joseph Finlay, Miri Franklin, David Rosenberg and Richard Kuper, has taken leave of its senses. They seem incapable of understanding or appreciating that they are effectively setting up a group with an apartheid structure. Again they were not prepared to debate this. JVL should be a political group in opposition to the Zionist politics of the JLM. What it is doing is pretending that it is a broad based ethnically Jewish group and smuggling its politics in by the backdoor. Hence its Jewish only structure. Everything I predicted about this decision has come to pass. Jewish members of the group have expressed their resentment at non-Jews participation and made the latter feel guilty. There were even suggestions for a non-Jewish FB group! 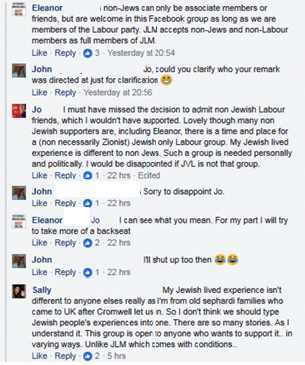 After a woman (Jo) expressed her hostility to the involvement of non-Jews in the Facebook group, one woman Eleanor promised to take ‘more of a backseat’. Another non-Jewish member John reacted by saying ‘I’ll shut up then.’ Yet Jo and others began to whinge that I had publicised what they thought were their private discussions! Yes it’s unfortunate that some members of the group have enough courage and principle to leak information to me. However all’s well that ends well. 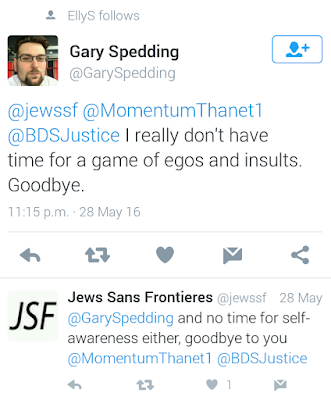 After having defended Gary Spedding against all comers in the end the JVL moderators bowed to the inevitable and removed both him and the even more vitriolic Ari Moshe. 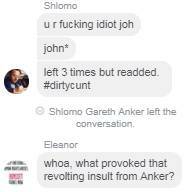 However that still leaves Shlomo Anker, who has even posted a report on the JLM’s recent conference on the JVL site. Rob Abrams is another Zionist who has been left untouched.